Families are often unaware of the increasing help that their elderly loved ones need, such as help with cooking and housekeeping. Value Care makes the difference by referring a qualified and caring professional homemaker companion. We have been serving clients since 2007 and have built our company on the belief that clients should get affordable help and peace of mind from top quality caregivers. 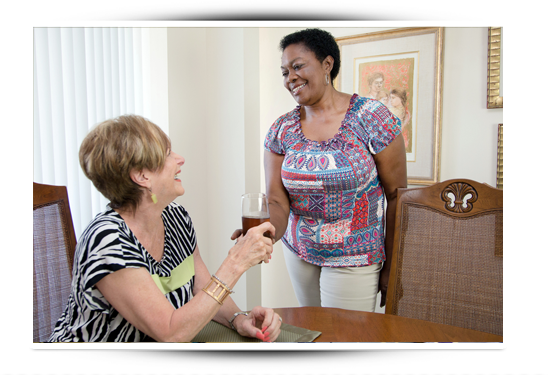 We match clients with caregivers who are able to help at home with a variety of daily tasks. Clients work with their caregivers to decide what type of schedule works best for them, so they never have to pay for extra care they do not need. Personal support, such as bathing, dressing or feeding. Neighborhood errands such as food shopping, going out to eat, going to visit friends, and any other transportation needs. Homemaker help with organization, cleaning, pet care, and little things around the house. Companionship; someone who listens and cares about you. Whether you are looking for a homemaker a few times a week or an around the clock homemaker, Consider Us to find a professional homemaker who fits your needs. All caregivers that apply to register with us are extensively screened to meet all legal qualifications and regulations. Additionally we conduct our own special screening procedures that we call our FIVE STAR PROMISE. These screenings ensure all homemakers have at least one year of experience with solid references, are able to pass written and verbal competency tests, and are thoroughly trained in client transfer techniques. At Value Care we care about our clients and want them to rest assured that they will be in competent and compassionate hands. We also offer a First Day Satisfaction Guarantee to make certain each and every one of our clients is completely satisfied with their choice in a homemaker. If you would like to hear more about our First Day Satisfaction GUARANTEE or are in need of homemaker, Call Us Today.